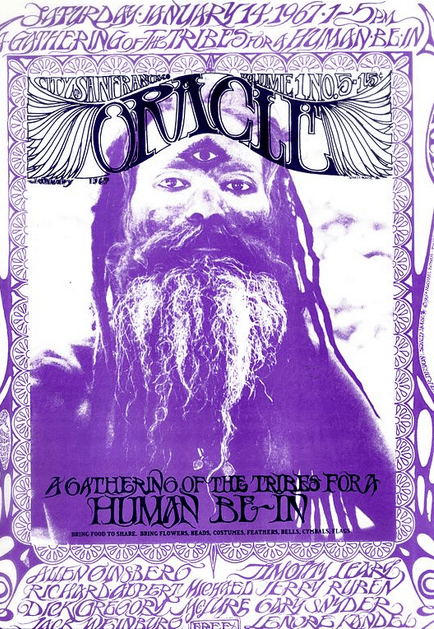 Photo: cover of the “San Francisco Oracle,” Volume 1 No. 5, January 1967, announcing the upcoming “Human Be-In.” Credit: the Estate of Allen Cohen and Regent Press; Wikimedia Commons. Despite being loose in its planning and execution – this was, after all, the counterculture – the Be-In went remarkably well that day. The police made no arrests. Tourists gathered to watch the spectacle. The sun shone, the music and poetry were great, and the participants had fun. It is becoming lost lore now, but “Ins” were quite popular in the ’60s. The Civil Rights and anti-war movements were having sit-ins. Campuses were having teach-ins. The hippies were having be-ins and love-ins. A year after the Golden Gate Park Be-In the term went mainstream when NBC launched Rowan and Martin’s “Laugh-In” comedy show on 22 January 1968. The Golden Gate Park “Be-In” was a seminal event. The entertainment was provided by such now-legendary rock bands as the Grateful Dead and Jefferson Airplane, and poets such as Allen Ginsberg and Gary Snyder. Timothy Leary, guru of the psychedelic drug LSD, addressed the crowd and delivered his famous advice: “Turn on, tune in, drop out.” LSD had only recently been made illegal (on 6 October 1966), but Owsley Stanley – who manufactured and provided the LSD for the “acid tests” staged by Ken Kesey and the Merry Pranksters the previous two years – provided LSD for the San Francisco “Be-In,” no doubt contributing to some of its zaniness. The following four newspaper articles provide an indication of how the mainstream press and public reacted to the Be-In and the growing counterculture. The first two articles report on the Be-In itself. 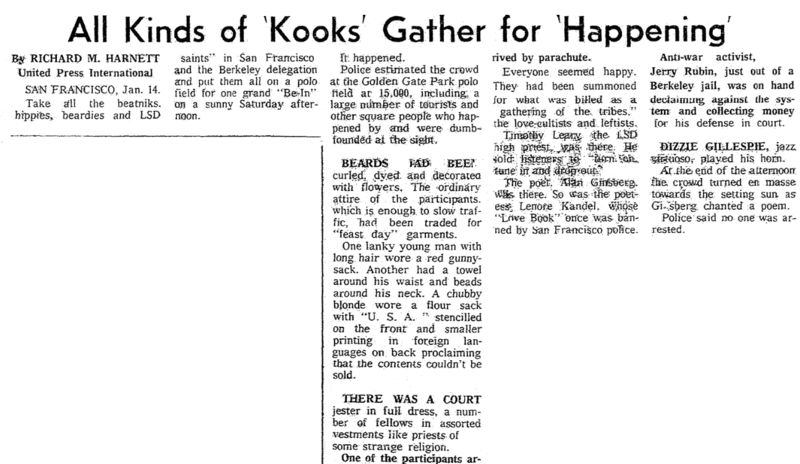 The third reports on San Francisco Mayor Shelley expressing concern that the “Summer of Love” that would follow the Be-In would bring 100,000 hippies flocking to his city – which in fact did happen. The fourth article provides a rabbi’s insights into the youthful minds of the counterculture. SAN FRANCISCO, Jan. 14. 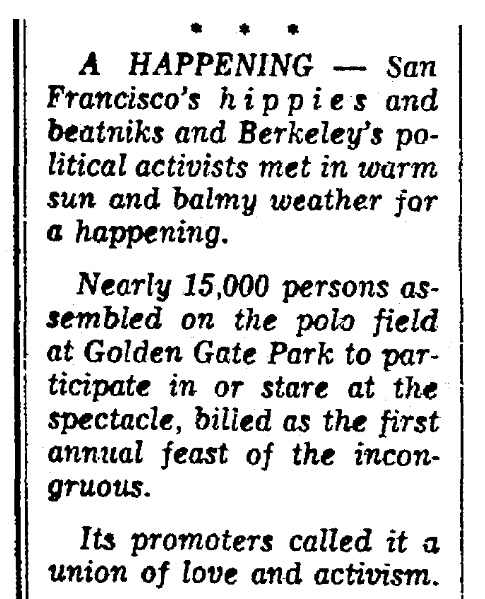 – Take all the beatniks, hippies, beardies, and LSD “saints” in San Francisco and the Berkeley delegation and put them all on a polo field for one grand “Be-In” on a sunny Saturday afternoon. Police estimated the crowd at the Golden Gate Park polo field at 15,000, including a large number of tourists and other square people who happened by and were dumbfounded at the sight. Beards had been curled, dyed, and decorated with flowers. The ordinary attire of the participants, which is enough to slow traffic, had been traded for “feast day” garments. One lanky young man with long hair wore a red gunnysack. Another had a towel around his waist and beads around his neck. A chubby blonde wore a flour sack with “U.S.A.” stenciled on the front and smaller printing in foreign languages on back proclaiming that the contents couldn’t be sold. There was a court jester in full dress [and] a number of fellows in assorted vestments like priests of some strange religion. One of the participants arrived by parachute. Everyone seemed happy. They had been summoned for what was billed as a “gathering of the tribes,” the love-cultists and leftists. Timothy Leary, the LSD high priest, was there. He told listeners to turn on, tune in and drop out. The poet Alan Ginsberg was there. So was the poetess Lenore Kandel, whose “Love Book” once was banned by San Francisco police. Anti-war activist Jerry Rubin, just out of a Berkeley jail, was on hand declaiming against the system and collecting money for his defense in court. Dizzie Gillespie, jazz virtuoso, played his horn. At the end of the afternoon the crowd turned en masse towards the setting sun as Ginsberg chanted a poem. Police said no one was arrested. San Francisco’s hippies and beatniks and Berkeley’s political activists met in warm sun and balmy weather for a happening. Nearly 15,000 persons assembled on the polo field at Golden Gate Park to participate in or stare at the spectacle, billed as the first annual feast of the incongruous. Its promoters called it a union of love and activism. SAN FRANCISCO, Calif. (UPI) – Mayor John F. Shelley had a message Thursday for young hippies planning to join the Haight-Ashbury scene this summer – stay home. Shelley asked the board of supervisors to make a policy statement opposing a migration of “indigent young people” into the city. Some Haight-Ashbury leaders have warned that up to 100,000 young hippies may invade the district during the summer. “I am strongly opposed to any encouragement of a publicized summer influx of indigent young people who are apparently being led to believe by a certain element of society that their vagrant presence will be tolerated in the city, particularly in the Haight-Ashbury district, without due regard to their needs for food, adequate shelter and other necessities,” the major said. Shelley warned that city laws would be strictly enforced and that hippies would not be permitted to sleep in Golden Gate Park, adjacent to the Haight-Ashbury. Jewish Official Cites Young Unrest in U.S.
Social unrest among young people is more evident in the United States than in any other country in the world, a national B’nai B’rith official from Washington, D.C., said here Monday. “Since we have more students in proportion to our population than any other nation, we give them a more important role in society, and they respond accordingly,” said Dr. Alfred Jospe. Dr. Jospe, national director of the program and resources of the B’nai B’rith Foundations, was in Dallas where he addressed the annual meeting of Jewish Family Service Monday night. “In my extensive travels and studies abroad, I have never witnessed the same kind or equal extent of youth unrest that we have here,” he said in an interview. “Otherwise, their pediatric knowledge of religion – which is usually about equivalent to eighth-grade standards – will evaporate in the intellectual climate of a university,” he said. Admitting that young people may “go too far by condemning everything,” Dr. Jospe called for patience and sympathy on the part of elders. 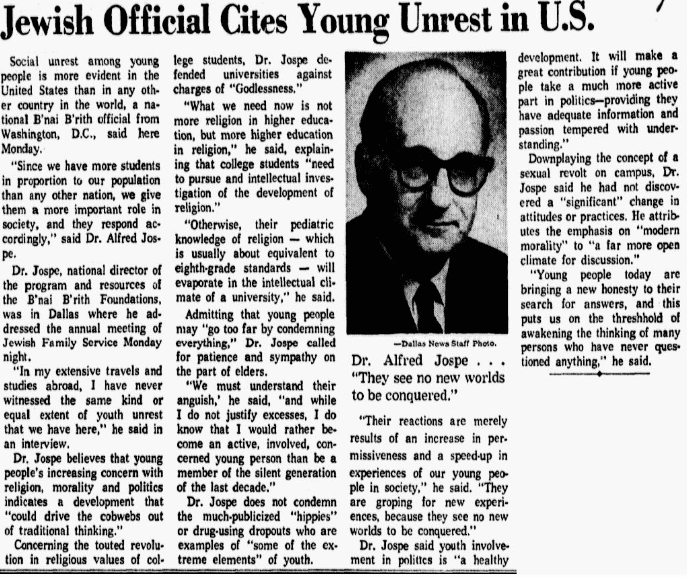 Dr. Jospe does not condemn the much-publicized “hippies” or drug-using dropouts who are examples of “some of the extreme elements” of youth. “Young people today are bringing a new honesty to their search for answers, and this puts us on the threshold of awakening the thinking of many persons who have never questioned anything,” he said. Note: An online collection of newspapers, such as GenealogyBank’s Historical Newspaper Archives, is not only a great way to learn about the lives of your ancestors – the old newspaper articles also help you understand American history and the times your ancestors lived in, and the news they talked about and read in their local papers – as well as more recent events. Were you in San Francisco for the first Human Be-In? Please share your stories with us in the comments section below.